Blackberry bushes are extremely invasive. Once you have them in your yard, it's almost impossible to get ride of them. They constantly pop up at various spots on Sand Village Farm. Although I love perfectly ripe blackberries, I have to keep cutting the berry branches off. They are just too thorny! So, instead of growing my own blackberries, I go pick them just like I would with wild mushrooms. They grow abundantly in the neighborhood and are free for the picking. As you can see in the picture above, it grows on someone's fence. In addition to providing berries, the bushes also act as a barrier against critters and burglars. Believe me, you would not want to fall into these bushes. I took a walk this afternoon and picked a bunch of blackberries. There were a few other people picking them, too. Some areas obviously have been picked over. It would be a shame to let these wild blackberries go to waste. The East Bay Area is experiencing another heatless summer. On average we are having mid-60 temperatures. I have plenty of tomatoes on my 10+ tomato plants scattering all over the farm, but they are taking painfully long to ripe. I refuse to buy tomatoes from stores ever since I started growing my own 3 years ago. The tomatoes in the top photo are the first ones to turn red. Historically, the squirrels also eat my tomatoes. Recently a neighbor adopted a very friendly outdoor cat, who's been patrolling Sand Village Farm. I haven't seen the cat chasing any squirrel yet, but Dusty has been quite upset at the sight of the cat. The cat seems mildly curious about Dusty but shows no aggression. Dusty on the other hand would thump his large hind feet and make a loud noise whenever he sees the cat. I saw the cat got startled and jumped up at the loud thumping sound. Hopefully I can get a video clip of that funny scene sometime soon. 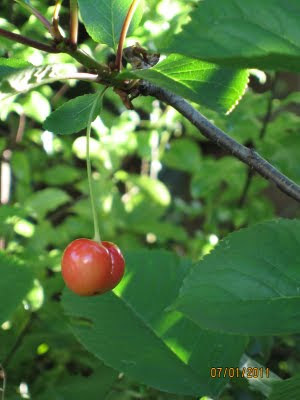 On April 4th, I discovered one successfully grafted cherry scion; unfortunately, that section ended up dying. To my surprise, I discovered another success on the opposite side of the tree! This one has actually grew a couple new branches and one single cherry! 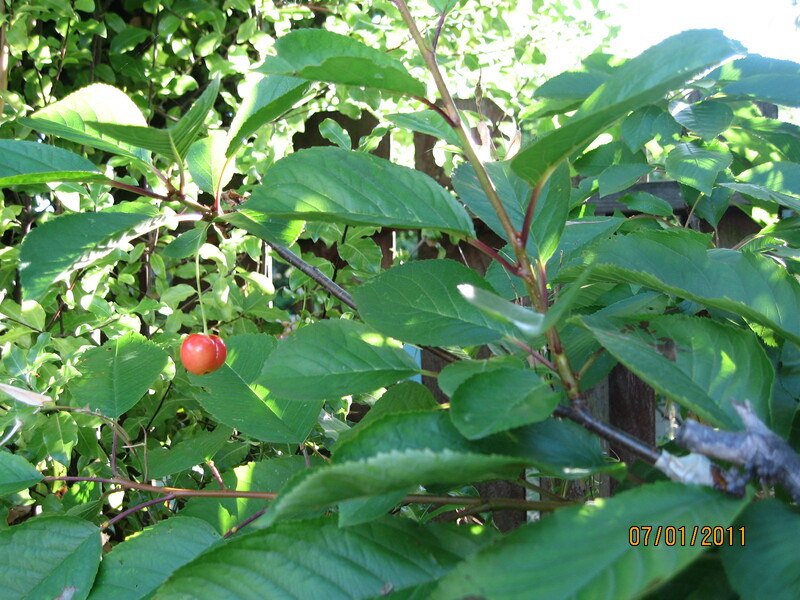 For weeks, I watched the cherry in fear that any second it would be taken by a bird or a squirrel. Although it was not completely ripe, I ended up picking it and ate it. Next year, this grafted new section should grow more cherries. I also discovered a passion flora in full bloom on June 16th. Today, I was surprised to see two passion fruits growing at where two flowers were previously. I can't believe that I didn't notice them before. 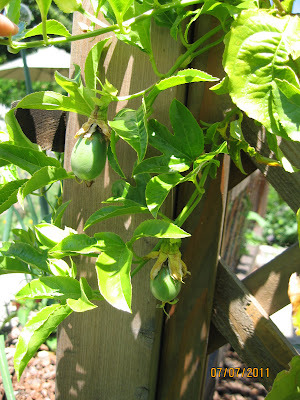 It's starting to look like I will have a few passion fruits this year since the vine is full of flower buds.